With so much to see and so much to do in Chicago, how do you get around? 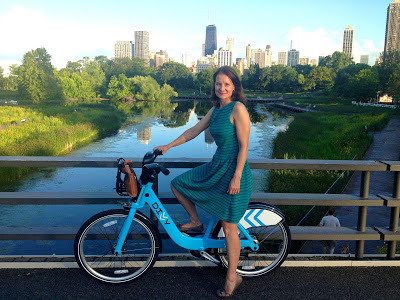 One of my favorite discoveries was DIVVY - Divvy gets you around Chicago in a jiffy. I wish every major city had Divvy and I wished it hadn't been winter and snowing in Chicago so this Floridian could have enjoyed using it. Divvy is a bike sharing system featuring thousands of bikes at hundreds of stations, available 24/7, 365 days a year. Perfect for both locals and visitors alike. Each station has a touchscreen kiosk, station map, and a docking system that releases bikes using a member key or ride code. Rent a bike and ride along the lake shore via 20 miles of bicycle paths that run north-south along the city's edge or tool through the city. The rental kiosks are everywhere and you can purchase an annual membership online or get a 24-hour pass.